Showcased at this year’s CES show, both are pocket-sized devices that users blow into. 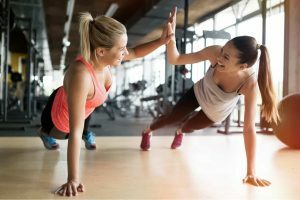 They pair with smartphone apps that tell people things like how well they are digesting food or burning calories. 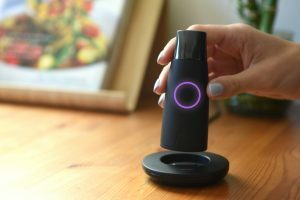 The firm behind Lumen states that their device provides a way for people to monitor their metabolisms. The device also has the capability of determining if the user is burning carbs or fats. Meanwhile, FoodMarble measures hydrogen levels in an attempt to make deductions about a person’s digestive health. 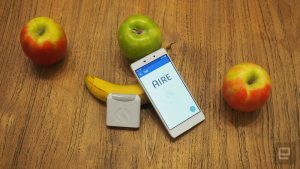 The thought is that the device can be to help people avoid foods that cause bloating, abdominal pain and other gastrointestinal symptoms. Here’s some killer wearable technology for fitness-minded folks. TRAQ, Alegria‘s first smart shoe, is the world’s first comfort smart shoes with built-in pedometer plus a personalized app community. The designs are made for walking, working and leisure, simultaneously allowing you to accurately count every step thanks to the smart Q-Chip embedded right in the shoe! 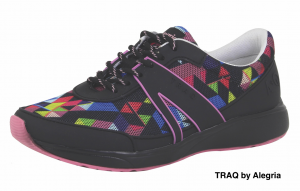 Easily connect the integrated pedometer in the shoes to the accompanying Alegria TRAQ smartphone app to view your daily and monthly step activity. You can do everything in your daily routine while stepping out in intelligent, blissful comfort. Anyone can track their steps, connect with their friends and compete on a leaderboard. Cheer on your friends and family to walk together through the app! Oh, and there’s no need to charge these smart shoes—ever—for the lifetime of the shoes. 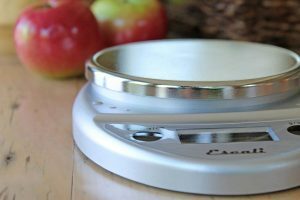 Assuredly due to due to the Escali Primo Digital Scale’s accuracy, speed and simplicity, it’s twice been rated as a best value by a leading independent consumer magazine, and was also recently named the “best kitchen scale for most people” by other key media. This device is capable of measuring in increments of 1 gram or 0.05 ounces and has the capacity to measure up to 11 pounds of food at once. Two-button controls facilitate ease of use, and a protective shield on the control panel prevents accidental spills from compromising performance. Battery life is also prolonged with an auto shut-off feature. As a branding pundit, wellness industry veteran, consumer health advocate and influential media voice, Merilee Kern spotlights noteworthy marketplace innovations, change makers, movers and shakers. Also a two-time fitness champion, her ground-breaking, award-winning “Kids Making Healthy Choices” Smartphone APP for children, parents/caregivers and educators is based on her award-winning, illustrated fictional children’s book, “Making Healthy Choices – A Story to Inspire Fit, Weight-Wise Kids.” Merilee may be reached online at www.LuxeListReviews.com. Follow her on Twitter at www.twitter.com/LuxeListEditor and Facebook atwww.Facebook.com/TheLuxeList.